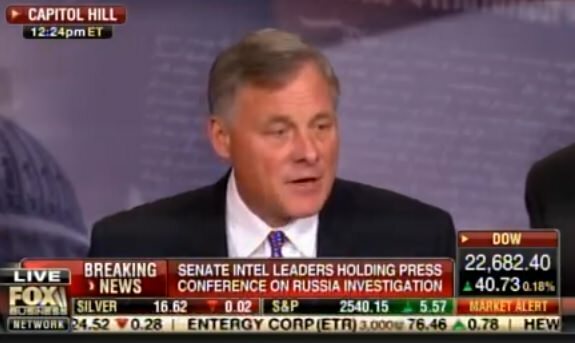 Republican Senator Richard Burr (R-NC) held a presser today to discuss the Senate Intelligence Committee’s ongoing Russian Collusion investigation. Republican Senator Burr said there is no evidence of Russian collusion into the 2016 US presidential election. This comes after thousands of hours of testimony and investigations. But Burr said the the committee will keep the investigation open! Burr is a useful idiot. Democrats want to ultimately shut down conservative websites. And Burr is too dense to understand it. Burr say the “issue of the collusion” is still open. Burradded that no vote totals were altered during election.